Join us in the fabulous historical setting of Cobh Heritage Centre where we will kick off Cobh Ukulele Festival 2018 with introductions, chat and tunes galore. Bring your Uke along for a Big Open Songbook Session. D’UKE A. DESMOND WILL HAVE YOU PLAYING AND SINGING BEFORE THE NIGHT IS OUT! Meet and greet will be followed by Ukulele Gigs in the wonderful pubs of Cobh. 12:00 -14:30 Why not start off your Sunday with BRUNCHELELE at the Ballynoe Inn? Following on from the success of last year’s inaugural Brunchelele, Cobh’s Own U-kan-uke will be hosting another great session in The Ballynoe Inn. Join them for Sing-Song, Music and Food. Everyone Welcome! 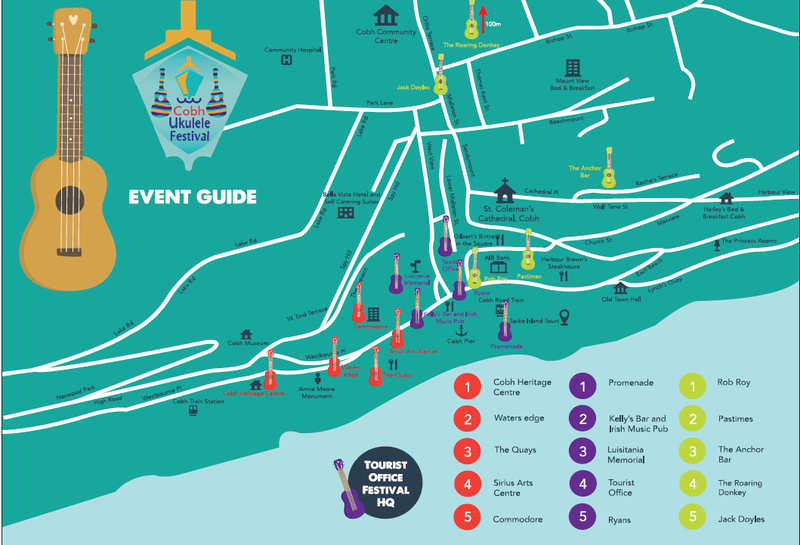 Say Farewell to Cobh Ukulele Festival for 2018 and join us in The Roaring Donkey from 6pm for the Festival Closing Party. One last gig from Nico’o and the Kapiolani Boyz to play us out. Bring your uke, as there will no doubt be a massive sing-song to finish in the style we have become accustomed to!!!!!! !